This Tofu in Tomato Sauce (Dau Hu Sot Ca) recipe is one of my favorite childhood dishes. The hearty tofu is cooked in a tangy and slightly sweet tomato sauce and it is pure comfort food. The tofu is commonly deep-fried in this recipe. However, my Mom, in all of her wisdom, minimized the deep-frying and was always converting recipes to make them healthier and more nutritious. I grew up eating really healthy, and not at all accustomed to foods drowned in oil, ladened with heavy sauces, or heavily salted or seasoned. To this day, I still enjoy and make this dish my Mom’s way, light and healthy. This Tofu in Tomato Sauce dish is super easy to make and you can serve it as a side dish or main entrée. Opt for the vegetarian version by replacing the fish sauce with soy sauce. I hope you love this recipe as much as I do! Remove the tofu from the packages. Rinse with cool water, drain and blot dry with paper towels. Cut the tofu into small pieces, approximately 1 inch cubes. Lay the tofu cubes on a plate. Cover with a paper towel and allow to dry while continuing to the next steps. Thinly slice the onions and green onion tops. Place in separate bowls. Slice the tomatoes into thin wedges and then each wedge in half. Combine the tomatoes with the onions. Heat a large skillet over Medium high heat and add 1 Tbsp of vegetable oil. Coat the skillet evenly with the oil using a brush or paper towel. Place the tofu pieces into the skillet. Leave some room between the pieces so they don’t stick together. (Cook tofu in batches if your skillet is not large enough to cook all at once.) Pan cook the tofu on the first side until golden brown, approximately 8 minutes. Flip the tofu and cook on the other side. Continue cooking the tofu on each side, approximately 2-3 minutes per side. (Be gentle when flipping the tofu as it is soft and breaks easily. If the tofu browns too much, turn down the heat.) Remove the tofu and place on a plate. Heat the same skillet over Medium heat. Add the remaining 1/3 Tbsp (1 tsp) vegetable oil, minced garlic and tomato paste. Stir fry for 10-15 seconds. Add the onions and tomatoes and stir fry for 2 minutes. Add water, fish sauce or soy sauce, sugar and black pepper. Combine everything well. Add the pan-fried tofu into the tomato sauce. Cover and simmer on low for 10 minutes. After 10 minutes, rotate the the tofu coating it with the tomato sauce. Cover and simmer for another 10 minutes. Combine everything together again. Remove from heat and top with the green onions. 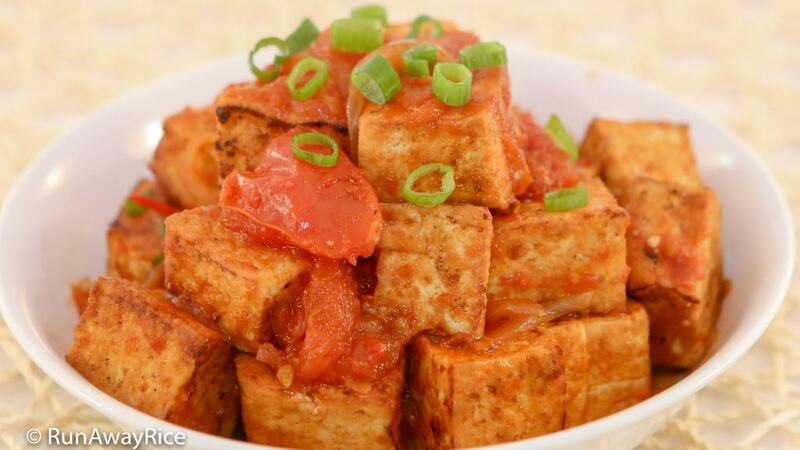 Enjoy the Tofu in Tomato Sauce with hot rice. If I already have a good tomato sauce and don’t want to make a new one, do I just heat it and add the tofu? Definitely, that’s great shortcut. Season the sauce to your taste and enjoy! I just tried this dish and it turned out really well :)! It tasted just like how my mom makes it :3. I was surprised that it didn’t take that much time to make either. Thank you for posting up the recipe for this ^O^!